PRODUCTNEWS Larson Electronics' Magnalight.com Releases Pole Mounted LED Work Light Magnalight.com has announced the release of the FPM-LED5W-30- 120V Telescoping Pole Mounted LED Work Light designed for use on man lifts and lift buckets within demanding and abusive work environments. Producing over 14,000 lumens and equipped with a simple slip fi t adjustable pole mounting system, this high power work light provides an ideal lighting solution for workers who frequently perform operations from man lifts and lift buckets and require powerful backlight illumination. For more information please visit Magnalight.com. 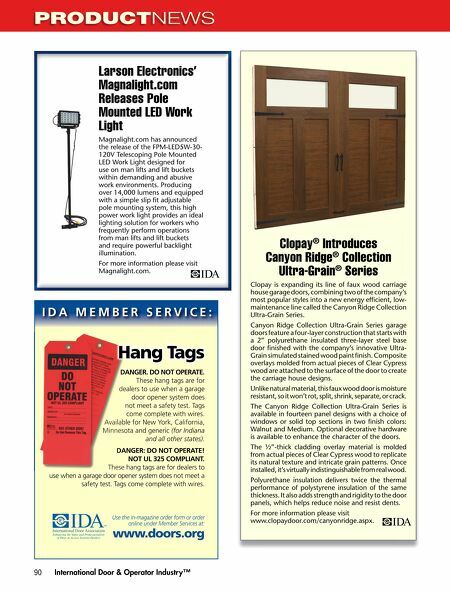 Clopay® Introduces Canyon Ridge® Ultra-Grain® IDA MEMBER SERVICE: Hang Tags DANGER. DO NOT OPERATE. D These hang tags are for dealers to use when a garage door opener system does not meet a safety test. Tags come complete with wires. de Available for New York, California, Minnesota and generic (for Indiana and all other states). Availab Minnes DANGER: DO NOT OPERATE! NOT UL 325 COMPLIANT. DA These hang tags are for dealers to These use when a garage door opener system does not meet a safety test. Tags come complete with wires. www.doors.org Use the in-magazine order form or order online under Member Services at: 90 International Door & Operator Industry™ Collection Series Clopay is expanding its line of faux wood carriage house garage doors, combining two of the company's most popular styles into a new energy effi cient, low- maintenance line called the Canyon Ridge Collection Ultra-Grain Series. Canyon Ridge Collection Ultra-Grain Series garage doors feature a four-layer construction that starts with a 2" polyurethane insulated three-layer steel base door fi nished with the company's innovative Ultra- Grain simulated stained wood paint fi nish. Composite overlays molded from actual pieces of Clear Cypress wood are attached to the surface of the door to create the carriage house designs. Unlike natural material, this faux wood door is moisture resistant, so it won't rot, split, shrink, separate, or crack. The Canyon Ridge Collection Ultra-Grain Series is available in fourteen panel designs with a choice of windows or solid top sections in two fi nish colors: Walnut and Medium. 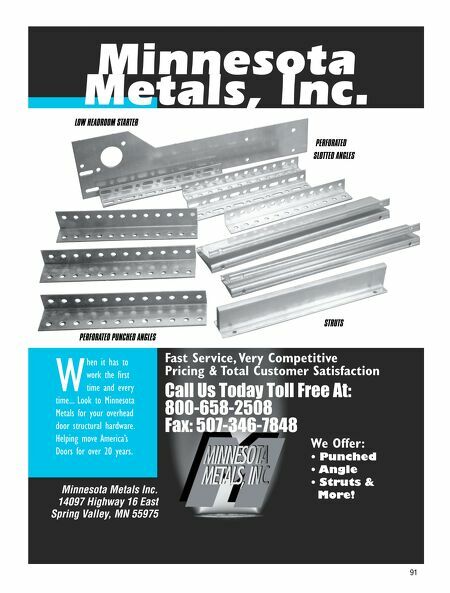 Optional decorative hardware is available to enhance the character of the doors. The ½"-thick cladding overlay material is molded from actual pieces of Clear Cypress wood to replicate its natural texture and intricate grain patterns. Once installed, it's virtually indistinguishable from real wood. Polyurethane insulation delivers twice the thermal performance of polystyrene insulation of the same thickness. It also adds strength and rigidity to the door panels, which helps reduce noise and resist dents. For more information please visit www.clopaydoor.com/canyonridge.aspx.